New Year’s Resolutions can be heard to keep year-round, however car maintenance shouldn’t be overlooked. In fact, making vehicle resolutions are easy to maintain throughout the year because they are necessary! Let’s take a look at 5 resolutions you can implement in 2019 to ensure you and your automobiles health. This one is easy. Take a few minutes to gather the essentials and store it in your car year-round just in case! We recommend non-perishable food, water, a blanket, flashlight, road flares, tire patch, and jumper cables. Can’t find the time? Opt for a pre-assembled bag; Consumer Reports breaks down the best emergency kits for your car. New year, new car smell! Don’t transport extra germs, contact us to schedule your detailing service. We offer a variety of options to keep the interior and exterior of your car looking fresh. This one is big! Make sure all of the necessary paperwork about your vehicle is easy to access in an emergency. Your registration, proof of insurance, and other vehicle documents should be filed together and stored in your glove compartment at all times. Shred or file any outdated documents to remove unnecessary clutter. Sometimes tires slip off our radar but worn treads can cause you and your vehicle harm. Make sure to take note of your car throughout the winter months and note your tire pressure on a regular basis; tires are more likely to deflate during the cold season. Need a second opinion? We offer services for your wheels. Although rain can offer a free exterior cleaning to your car, don’t rely on nature to keep your paint in good condition! Make time for regular car washes or visit us for paint correction services! 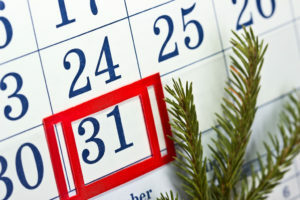 At Ricks Auto Detailing, we wish you a happy, healthy, and safe new year!